Turn your favorite editor into the professional side-by-side diff & merge tool with amazing features! 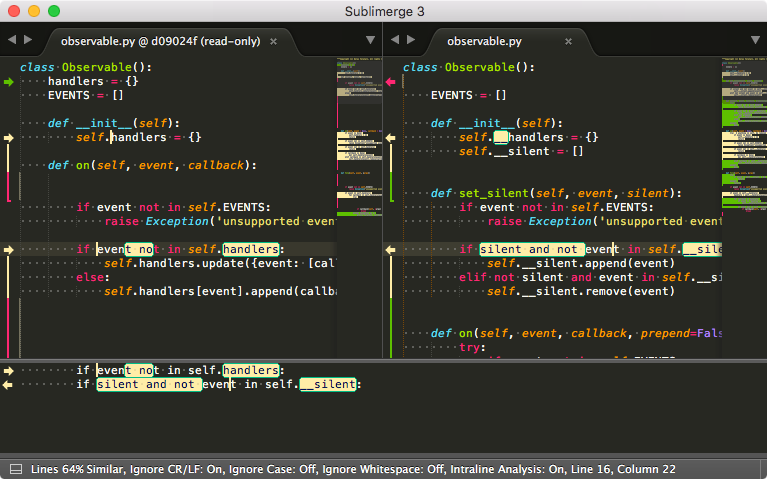 Sublimerge is not yet another diff plugin for Sublime Text. In fact, it is the most advanced and full-featured plugin which will turn your favorite editor into the professional side-by-side diff and merge tool with amazing features! How does it differ from other diff plugins? No external tools needed Side-by-side two-way and three-way diff that runs right inside Sublime Text! Interactive 2 ≠ 3 Pick and edit differences. Unlike in other plugins, the diff view is editable. Two-way Diff 2 ≠ 3 Easily compare the files side-by-side. Run from Sublime or command line. Three-way Diff 2 ≠ 3 Integrate with your VCS and use Sublimerge's advanced features to resolve merge conflicts. Live Diff 3 Just like in the best diff tools available on the market, you can type, cut, copy, paste and delete directly in diff view. Patience diff algorithm 3 Implements the best diff algorithm for source code. Patience diff is enabled by default. Undo & redo 3 We all make mistakes. Don't afraid them any longer. Sublimerge's undo/redo stack is unlimited. Directories Diff 2 ≠ 3 Compare directories side-by-side right in Sublime Text. Diff text files within directories structure. Snapshots Create and manage code snapshots. Compare to them easily or even revert your code to given point in time! Scroll sync The diff panes are in sync with each other. Scroll one, the other will sync automatically. Readable & clean interface 2 ≠ 3 The differences are marked with colorful lines. Intraline changes are easy to spot. Full Sublime Text integration Use Sublimerge to compare opened files, selections, clipboard and much more. Supports Git, Mercurial and Subversion The most popular version control systems are supported out of the box. Compare working copy & revisions. Extendable 2 ≠ 3 Missing some specific command? Easily implement your own diff commands using the Macros feature. Integratable Run Sublimerge from command line and integrate with anything. Configurable Configure anything! Colors, behavior, commands, diff algorithm and much more. …and much more! This is not the end of features. This is just the beginning! Your time is your money so no longer waste it. Forget switching again and again to external apps - now you get it all built-in, out of the box! Take Sublimerge for a spin!